Eileen Monaghan Whitaker, Academician in the National Academy of Design (NAD) was a member of the American Watercolor Society (AWS), listed in Who’s Who in America and Who’s Who in American Art, and throughout her career was a frequent juror for competitive art exhibitions nationwide. In 1948, she won an award in her first competitive exhibition and then went on to receive 87 major awards for her paintings. She was elected to membership in AWS in 1953, and in 1957 to associate membership in the NAD, where she was elected full Academician in 1978. Whitaker painted representational watercolors that reflected the diversity of her many interests. People were always a major source of inspiration, as well as nature, architecture, still life, and the cultures of the Southwest, Mexico and Guatemala. An emotional artist, Whitaker once said she “feels” her way through each painting. Frederic Whitaker died in 1980. Eileen Monahan Whitaker continued to paint prolifically. In 1982 she was commissioned by Copley Press to paint San Diego County. She explored the county for nearly four years, sketching, drawing, and photographing before completing the paintings in her La Jolla studio. The book, Eileen Monaghan Whitaker Paints San Diego, was published in 1986. After extensive travels to Guatemala in the 80s, in 1990, Eileen Monaghan Whitaker had a one-person exhibit Eileen Monaghan Whitaker: Watercolors of Guatemala and Mexico at the Charles and Emma Frye Art Museum in Seattle, Washington. 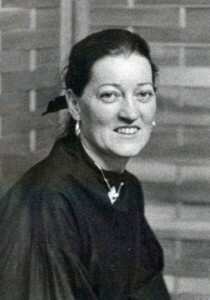 Eileen Monaghan Whitaker painted regularly until she was in her mid-90s and continued as the head of the Frederic Whitaker and Eileen Monaghan Whitaker Foundation up until her death in 2005.